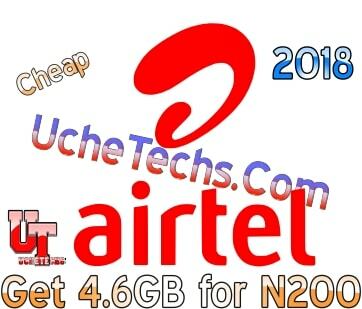 UcheTechs is at it again and this time, it is Airtel Cheap Data Tip in Nigeria. Learn how to Activate Airtel 4.6GB for N200 and 18.4GB for N800 Data. Anytime there is an Airtel trick, you must have noticed the Data is usually huge, just like the Airtel Port trick, so this time, best rest assured you can utilize the GB to the fullest. Notice that this isn't a Trick on Airtel but a Cheap Data Plan from Airtel to random subscribers. We provide you with Free internet on this blog. If you need the Latest MTN mPulse Internet trick, Read About mPulse Here, then join us on Telegram for settings. Let's discuss less on these and focus on the main topic. "Dear customer, congratulations! you can enjoy 100% DATA BONUS ANYTIME"
1. keep recharging N200 using the recharge format above. Recharging 4 times will give you a whopping 18.4GB data. This is how to Get Airtel 4.6GB for N200 and 18.4GB for N800, you can also use the same method above and get Airtel 24GB for N1000. If this worked for you, don't forget to comment below.